We all want to take better care of ourselves. The truth is our bodies have become toxic. There is one fun and exciting way you can detoxify your body and that is by an exercise that is both effective in ridding the body of harmful toxins and cleansing the lymph nodes, and this is achieved by rebounding exercises. Rebounding is simply jumping up and down on a mini trampoline. Rebounding is safe and easy to do and research has suggested that rebounding is one of the most effective exercises ever for overall health of the body. The best thing about performing rebound exercises are that they are fun. 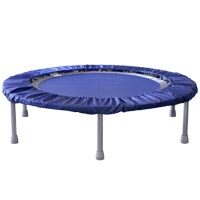 The rebounding trampoline is generally a much smaller version of the trampoline. The average rebounder comes ready to use. The rebounder is great for use in the privacy of your own home or office. Start out slowly by simply bouncing, keeping your feet on the trampoline for one minute. Don’t start off right away by jumping, work your way up gradually to jumping. Set weekly goals for yourself increasing your time spent on the rebounder. Try working your way up to bouncing up and down or jumping for a period of 5 minutes a day. There are many fun rebounding exercises so do some research on the many exercises you can add to your daily routine. Stabilizes and lowers blood pressure. Circulates oxygen to organs and tissues. Helps to prevent cardiovascular disease. Prevents obesity by stimulation of the metabolism. Works to improve glandular function. Rebounding exercises are the way to a happier and healthier lifestyle. Finally a proven way to have a great time and lose weight and improve your health. Like the saying goes if it feels good do it, well rebounding feels good so give it a try and bounce yourself back to a new improved you.